When we talk about rye whiskey, we often nod toward the past: pre-Prohibition cocktails and speakeasy culture. But now the bold and spicy spirit is trending and coming back into its own. That includes a lineup of next-gen styles that are definitely not your grandpa’s rye. While we still have a soft spot for familiar rye whiskies (like Rittenhouse, Sazerac and Bulleit), here’s a look at four ways that rye producers are pushing boundaries. New Mexico may not seem like whiskey country, but producers there are experimenting with “desert-aged” ryes, which create whiskies with surprising floral, citrus and spice-cake notes. Try: Turley Mill Cask Strength Single Barrel Straight Rye Western Whiskey (KGB Spirits, Alcalde, NM, $90). Aged six years, this unusual whiskey offers tons of vanilla, orange peel and spice. It’s cask strength, so dilute to taste. Although rye whiskies often are bottled with relatively high alcohol levels, a growing number are taking cues from Bourbon and Scotch and rolling out bottles at cask strength. That means bolder flavor, but you’ll want to add water, ice or both to taste. Try: Redemption Barrel Proof Straight Rye Whiskey (Deutsch Family Wine & Spirits, White Plains, NY, $80). Aged eight years and bottled at a stunningly high 122 proof, look for concentrated espresso, toffee and clove. Just as bakers are obsessed with heirloom grains, so are distillers. Look for rye varieties like Merced, Hazlett or Abruzzi. 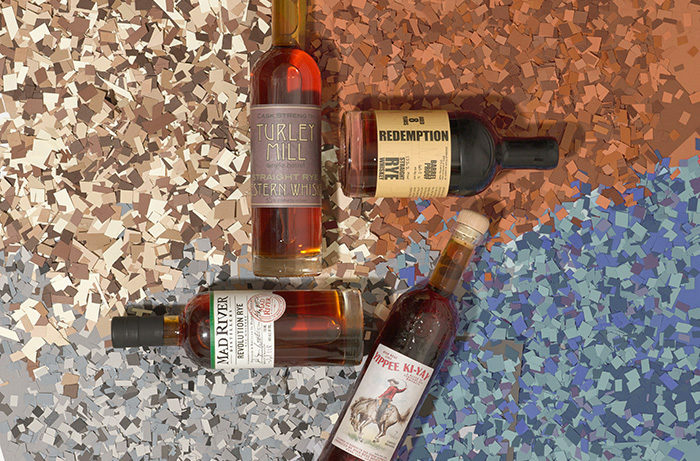 Some bottles, like Vermont’s Revolution Rye, use a mix of these heirloom ryes. Try: Revolution Rye (Mad River Distillers, Warren, VT, $50). Three rye varietal grains, a portion of which is malted and roasted “chocolate” rye, create deep toffee and orange peel flavors. After the traditional aging process, some producers are giving rye a turn in barrels that previously held fortified wines such as Madeira, Sherry or Port. It softens the whiskey and adds an unusual layer of flavor. Try: High West Yippee Ki-Yay (High West Distillery, Park City, UT, $65) is made with a blend of straight rye whiskies finished in casks that once held vermouth and Syrah. Sip or mix into Manhattans.